Located in the center of Budapest’s commercial shopping district is a new pop-up art installation, but you might not notice it right away. 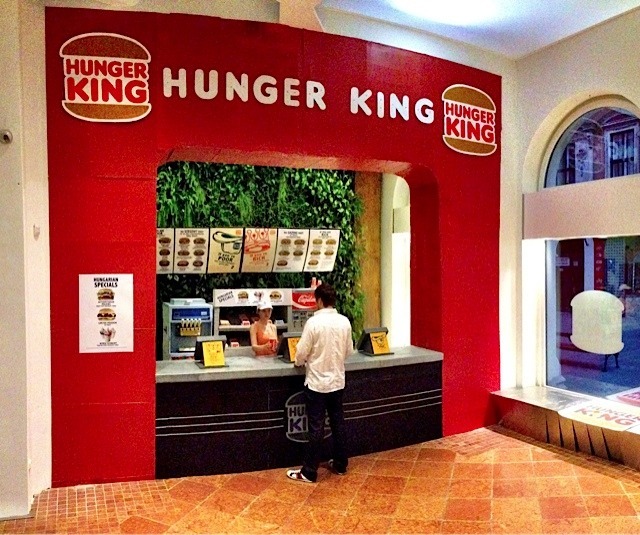 Finnish artist Jani Leinonen has built a replica of a fast food chain restaurant called “Hunger King,” but instead of serving burgers and fries, it is giving out boxes filled with cash to homeless people waiting in line outside. The piece is meant to highlight Hungary’s inequality issue, and is also in response to a 2013 law that criminalizes homeless people sleeping outside, imposing fines and possible jail time. Leinonen told VICE News that people are allowed to wait outside overnight for the opening of a shop or the arrival of a new product, but that does not apply to the homeless. Hunger King allows people to camp outside without being punished for it, the artist explained. Don’t get too excited about the Starbucks college deal. Read more here. The inspiration for the project came after Leinonen saw long lines outside the opening of several new Burger King locations in Helsinki, while nearby there was an equally long line of homeless people waiting to receive food handouts. How Seattle passed the highest minimum wage in America. Read more here. Lest anyone miss the message of Hunger King, it is located across from a Louis Vuitton store and the Budapest State Opera House. Hunger King has two lines outside, one marked for poor people and the other, with a red carpet, marked for the rich. The first 50 people in the “poor” line who enter the installation receive a burger box containing 3,400 forints (around $15). This is roughly equivalent to Hungary’s daily minimum wage. Alongside the two lines are signposts describing the “menu” for how the government treats both groups. Rich people get tax breaks, higher quality social services, and family benefits. The poor, on the other hand, face tax increases, worse benefits, and lack of equal opportunities for their children. Inside, customers can choose items such as “greed,” “sloth,” or “anger” from a soda machine with “Capitalism” written across it. Hunger King’s website offers a virtual tour of the project, also dividing visitors between rich or poor, where they are then directed to tweet messages at Hungarian politicians. The right to film cops is important, but it's no justice. Read more here. Leinonen said he was invited to do the project, which runs up until July 6, by the Finnish Cultural Institute, which provided part of the funding. “The institute had seen my previous projects [on social activism] and they knew the Hungarian situation well so they invited me to do something there,” he told VICE News. Leinonen added that he was open to bringing Hunger King elsewhere, including across the Atlantic. “There’s been lots of invitations and discussion about bringing this project to the US or other cities in Europe. It would be amazing if it could be in London or New York."